Life in the Boomer Lane must agree with our esteemed POTUS: climate change (i.e. : global warming) has a positive impact on the planet. In POTUS’ case, global warming is his own personal national thermostat. Just turn the dial. A little bit of global warming here and there can immediately raise the temps in the currently frostbitten Midwest and make things a lot more comfortable. Better yet, it can take the chill off of the Mar-a-Lago golf course, on those early tee off mornings. To this, LBL replies, “Why, yes, it does, you Alert Little Reader, you.” POTUS, however, is no longer here to read LBL’s reply. He exited this blog post at about sentence #2, and wandered over to blog posts that require little else other than a vague knowledge of popular culture and the ability to see brightly colored objects. We will be forced to continue without him. Start buying properties inland. Raggedy, forgotten pieces of land inland from coasts and now populated by cheesy motels and dollar stores, are America’s next beach playgrounds. Deals are to be made, here. Buy what you can and sit tight, waiting for some hotel chain to offer you a bundle for your weed-choked parcel. Buy stock in companies that sell fire fighting equipment, insect repellant, and those intending to build luxury resorts north of the Arctic Circle. Divest yourself of all igloo stock. Instead, start stockpiling bottled water, for sale at a later date. Sell your polar bear tracking and photography equipment. Instead, start a marmot ranch. 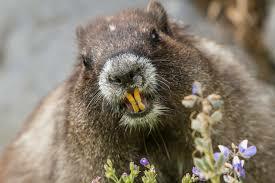 (Marmots will get bigger and stronger in this new, warmer climate.) Then create a worldwide demand for marmots. Start stockpiling Israeli marshmallows. This has noting to do with climate change, but is a hot item on Twitter, so LBL is throwing it in as a public service. There, that about sums up everything you need to know at the moment. We may now call POTUS back into the room, by dangling a donut in front of him and promising that LBL’s next blog post will be about a new TV remote technology that inserts silly hats, mustaches, and blacked-out teeth on all CNN commentators. Then, as they speak, the audio plays tapes of old Three Stooges shows. I think you’re on to a winner there! Thanks. I’m going to write a book called “Make Climate Change Work for You.” Trump will write the intro. So the 1% are going to be a little bit less ‘inconvenienced’ than the rest of us poor schmucks. I think most of them already have airfare to some distant planet in which everything is pristine and awaiting their destruction. Many thanks, Ilona! I live for comments like these.